Your list of things to see and do now includes Universal's Volcano Bay, WhirlyDome, Sky Zone Trampoline Park - Orlando, and other attractions. We've included these beaches for you: Beach at Daytona Beach and Discovery Cove. 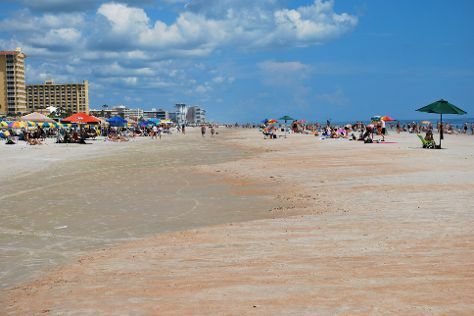 You'll discover tucked-away gems like Cocoa Beach and Ormond Beach. Go for a jaunt from Orlando to New Smyrna Beach to see Galleria di Vetro about 1h 15 min away. Pack the 15th (Sat) with family-friendly diversions at Universal Orlando Resort. The adventure continues: have some family-friendly fun at The Escape Game Orlando. To see traveler tips, reviews, ratings, and more tourist information, read Orlando vacation planning site . In June, daily temperatures in Orlando can reach 91°F, while at night they dip to 73°F. Finish up your sightseeing early on the 15th (Sat) so you can travel back home.